The science of genetics is taking great leaps forward, and MetaMorphix, Inc. is at the forefront of canine genetic testing. If you've ever questioned what kind of dog you have, this interview explains how a DNA breed test can reveal its heritage. MetaMorphix has designed a test that uses genetic markers to identify the breed or breeds in your dog's background. What can you do with this info? To find out, read our exclusive interview with Dennis Fantin, Ph.D., M.B.A. and MetaMorphix Executive Vice President and Chief of Operations. Dennis, please give us a little background about MetaMorphix. MetaMorphix, Inc. is a life science company that uses DNA to improve animal wellness, advance livestock production and progress human health. The company has been a leader in the field of genomic discovery and applications in the area of animal biotechnology. MetaMorphix has well over a decade of experience in the area of Canine DNA research. As a world-leader in the discovery and commercialization of DNA-based marker systems that enhance the ability to identify individual dogs, verify parentage, determine breed type and confirm gender, MetaMorphix has been at the forefront of developing technology and providing value-added services to the canine community. To date, MetaMorphix has DNA tested over a 600,000 dogs, and is the principal provider of DNA testing services for several major canine breed registries including the American Kennel Club (AKC), the United Kennel Club (UKC) and the Professional Kennel Club (PKC). This unparalleled leadership continues to help protect the efforts of canine registries and support dog breeders around the world. What kind of information does a dog DNA breed test provide? The Canine Heritage™ Breed Test is the first DNA-based diagnostic test that can genetically determine the breed composition of your dog. The Canine Heritage™ Breed Test can currently distinguish among 38 of the most prevalent breeds. A next generation product will be introduced in Fall 2007 that will identify over 116 breeds. Basically the Canine Heritage™ Breed Test looks at the underlying genetic structure of breeds. The Breed Test uses state-of-the-art DNA technology, based on 96 single-nucleotide polymorphism (SNP) markers. Genotypes from dogs are run through an algorithm that "clusters" animals based on their genetic makeup. Primary: The majority, or predominant, underlying genetic profile of the dog matches purebred dogs of that breed. Secondary: The underlying genetic profile matches purebred dogs of the breed, but is not represented in the majority of the DNA profile. In the Mix: Part of the dog's DNA profile matches the profile from purebred dogs, indicating a minimal representation of the breed identified. 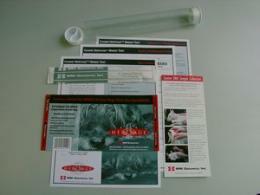 Customers can order a kit from our website at Canine Heritage. The kit is shipped and when received, customer follows the simple instructions to take DNA samples from their pets. The kit contains a soft bristle brush (CheekSwab™) that the customer rubs against the cheek of his dog. This non-invasive and painless method makes it easy for all dog owners to take a DNA sample from their dog. The swab is then packaged in the mailer provided, and sent to our lab in Davis, California for analysis. Once the analysis is completed and results have been quality verified, a Certificate of Breed Analysis outlining the results of the Canine Heritage™ Breed Test is printed and mailed back to the pet owner. Results are typically returned in four to six weeks. How can pet owners apply the information they receive? The Canine Heritage™ Breed Test can be used to determine the lineage of mixed breed dogs. We have noticed that people have been having a great deal of fun going through the process and have exclaimed that knowing more about their pet's breed mix satisfies an innate curiosity about their pet's "roots." After all, pets are part of the family tree too! We also believe that there are a number of germane reasons for learning more about one's dog breed composition. Given that certain breeds are predisposed to certain health issues and can exhibit distinct behavioral characteristics, an individual may be able to infer health, personality or behavior of their dog from the "general" characteristics of the identified breed(s). Mixed breed dog owners can take the information gathered from this painless test and talk to their vet about the results. The results may help the owner and their veterinary health care professionals develop steps to protect against diseases, manage health over a lifetime and expand training programs for their pet. The product is very progressive in that regard. Do you foresee even greater uses for canine DNA testing in the future? MetaMorphix continues to use its resources and expertise in the area of canine genomics to develop products that are leading to a revolution in canine animal health care and healthier, happier pets. Through use of our state-of-the-art genomic R&D platform, MetaMorphix is developing DNA based diagnostics that are able to predict predisposition to highly debilitating diseases such as canine hip dysplasia. The premise is that if a DNA test could be conducted at a very early stage in a dog's life, susceptibility to certain diseases and health issues could be determined and subsequently wellness could be better managed throughout a lifetime. For example, if a dog owner or veterinarian knew a particular dog was prone to developing severe osteoarthritis, careful monitoring and subscribing to diets, weight guidelines and medication throughout a lifetime may dramatically impede the disease from reaching debilitating stages. In this way, health and wellness is managed over a lifetime and the focus of healthcare professionals is on preventative medicine rather than acute treatment. The exciting promise of this DNA technology is that pet and pet owner's lives will be enriched through DNA testing. 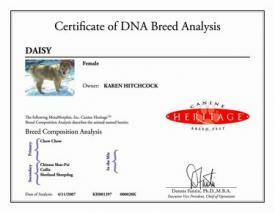 What does it cost to carry out a Canine Heritage dog DNA test? Currently, the cost for the test is $65.00 plus shipping and handling. The price for the next version is expected to be a little higher due to the number of breeds covered. Is there anything else you'd like our readers to know about your product? We welcome all reader's comments, feedback, stories and ideas. We love pets and we love pet people. If you're intrigued with the concept of DNA testing, and you'd like to order a test kit for your own dog, visit Metamorphix.